On a three-day trip to Portland, Oregon this week, I had a chance to witness some ways that the Rose City is moving toward a cleaner transportation future. To start out, my trip into downtown from the airport was on the Trimet electric train system. The Trimet Max Red Line docks steps away from the baggage claim area, and for $2.50, you can sit in a clean, comfortable chair and look out the picture windows at the Oregon scenery. It was clear and beautiful my first day, but, naturally, became gray and rainy later. But that was pretty nice looking (and smelling) too. Once I stepped off the train onto the street, I walked the several blocks to my company’s Portland office. Along the way, I passed four things that told me that Portland is working hard on going green. I walked past the Forth Mobility showroom. Forth is set up to give people a chance to learn about and test drive electric vehicles, including the Nissan Leaf and Chevrolet Bolt. On my way out of town, I dropped in and chatted with Sergio, who showed me the displays, which included a sample of wall-mount charging stations and a screen folks can use to determine which EV would work best for them. A couple of blocks further, I spotted Electric Avenue (see photo, above). This brightly painted spot at PGE (Portland General Electric) headquarters, sports six charging stations–Level 2 and Level 3. Located near Forth, it’s a good one-two punch for EV awareness and use. Along the tree-lined streets, which were beginning to display some autumn-colored leaves on the ground, I spotted two ways to drive around without owning your own car. ReachNow is BMW’s car-sharing service. I saw the logo on the sides of Minis and BMWs wherever I went. Tucked into other spots were the Car2Go vehicles, which feature cars from BMW’s German rival–Mercedes-Benz. I spotted numerous Smart EVs, along with the smaller Mercedes-Benz crossovers and sedans. In 10 minutes and six short blocks, I got a sample of Portland’s efforts to reduce traffic and greenhouse gases. On my first night in the city, I rode in a car on the way to my old friend’s home in suburban Gresham, and there was lots of traffic. These efforts in Portland should help congestion, as well. To top off my trip, on my return to the East Bay, I rode BART’s airport shuttle and the regular BART line most of the way home. The electric vehicle future is now. As an auto writer, I’ve been driving a new car every week from press fleets for a quarter century. 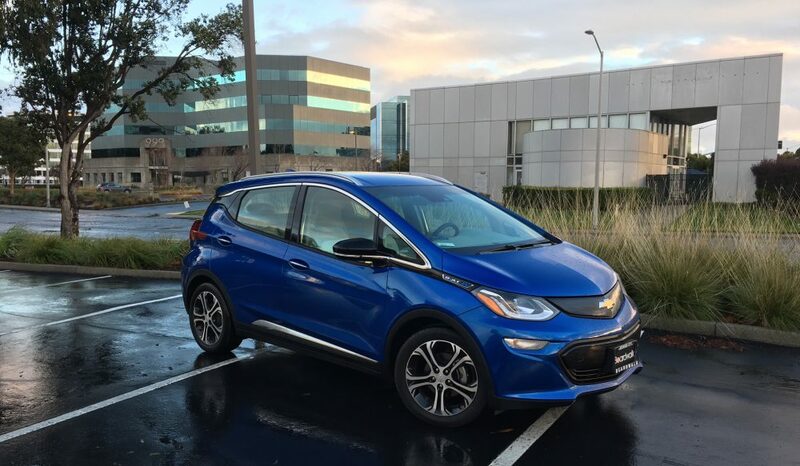 But on January 8, I took delivery of my new 2017 Chevrolet Bolt EV. It was my first new personal car since I acquired one of the first Saturns in November, 1990. Well, there’s something about having your own car. In more than 2,600 miles over nearly two months, I’ve bonded with my Kinetic Blue baby. I’ve realized that driving a car a week, as exciting as it may be (and sound) becomes impersonal. It’s a treadmill. It’s like being on the road with a Jazz band, staying in one hotel or motel after another with a steady stream of weekly gigs in towns across America. But I know my car now. I like changing Sirius XM and FM stations with a flick of my left hand on the button on the steering wheel column. Apple CarPlay lets me text by talking to Siri. I enjoy studying every flowing line of the dashboard and doors. I feel at home in the firm bucket seat. I can look through the little window in the otherwise enormous windshield pillar as I turn left. I’m grateful that I opted for the upgraded Bose stereo. It helps that the Bolt EV is exactly the car I need. I can commute 36 miles round trip every weekday with no problem, and charge at my workplace. I need to carry a tall upright bass and it slips in with nothing more than dropping the rear seats and removing the delicate cargo cover. The rear compartment has a flat floor, making it easy. The electric motor zips my Bolt ahead at a 6.5 second zero-to-60 pace, nearly silently. Freeway merges are easy and passing is no problem. As an EV driver, I try to conserve battery power, so I roll along at 65 tops on the freeway, which is kind of relaxing. What’s the hurry? I select “L” on the transmission lever to use one-pedal driving. It provides much more regeneration than the “D” setting, which replicates a normal automatic. I’m hooked on “L” now. In-town driving is fun with the firm, flat handling and precise steering control. The “L” driving feels a bit like downshifting when you come to a stop–the car helps you slow down–so it’s fun to position yourself accurately in the traffic flow that way. I’m still testing cars for the newspapers and blogs that use my column, and I’ve got some fine hybrids on the menu. I’m even sneaking in a few significant internal combustion cars. But I know that when I want to, I can slip into my Bolt EV and feel at home anytime.